Washing dishes is by far my least favorite chore. And it shows. As my daily mountain of dishes pile higher and higher, my desire to wash the dishes drastically diminishes. 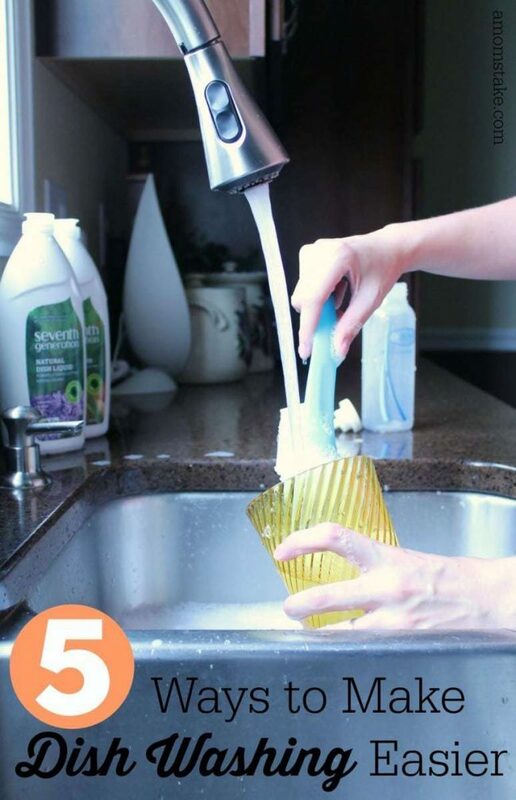 Although dish washing can be quite the dreadful chore, I have found 5 simple ways to make dish washing easier. 1. Keep your sink full of soapy water. As you dirty your dishes, place them in the soapy water and clean them as you go. 2. Use fewer dishes. The fewer dishes you use, the easier dish washing becomes. To cut down on the amount of dishes I have to wash, I assign each family member one cup/water bottle to use for the day. This is the cup they use for meals and when thirsty throughout the day. This cuts my dirty dishes in half. 3. Keep things organized. When loading your dishes in your dishwasher, place all like items together. Load all forks together, keeps spoons together, place the plates together, etc. This makes unloading SO much easier. 4. Wash dishes in order. To make dish washing easier, be sure to clean your dishes in a specific order. Start by scraping off all excess food. Clean your glass first followed by your silverware and then pots and pans. 5. Use a good dish soap. Dish washing becomes SO much easier when you use a dish soap that fights grease and grime. Want to know my favorite Dish Liquid for fighting tough dried-on food? Seventh Generation‘s Natural Dish Liquid. Seventh Generation’s non-toxic and biodegradable Natural Dish Liquid fights grease light none other. 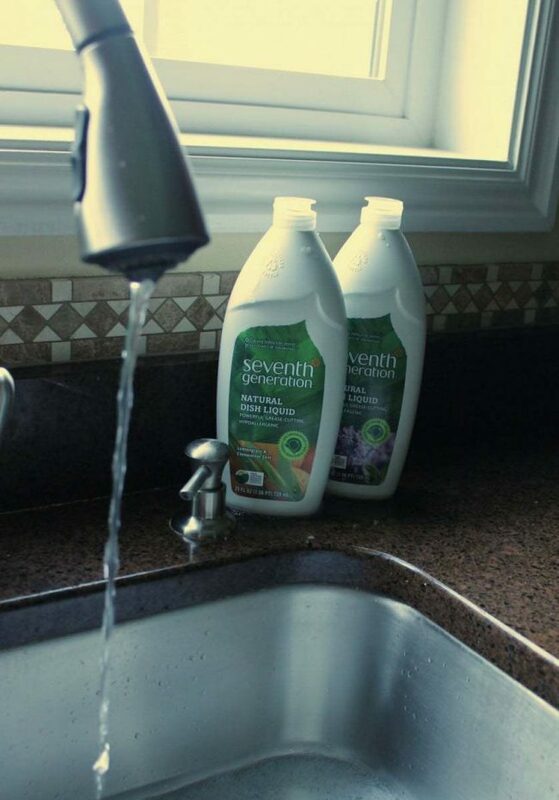 Using the power of plants to clean the toughest stains, Seventh Generation’s Natural Dish Liquid hypoallergenic formula comes in three delicious scents: Lavendar Floral & Mint, Lemongrass and Clementine Zest, Fresh Citrus and Ginger. Let me tell you, washing dishes with a refreshing aroma in the air makes dish washing SO much more enjoyable. 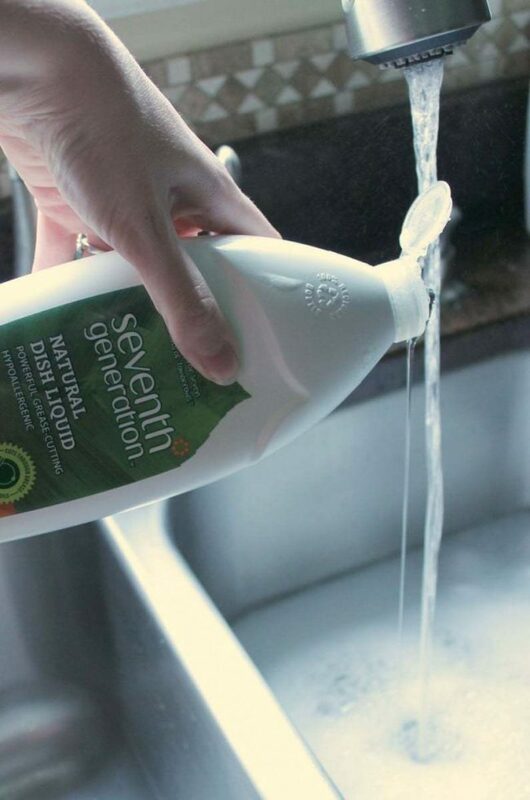 Make dish washing more enjoyable with Seventh Generation’s Natural Dish Liquid. Be sure to visit Seventh Generation and check out other safe and effective products for your home and family. What’s your favorite dish washing trick? I use Seventh Generation dish soap! I really like it! My dishwasher is a lifesaver. When I do need to hand wash I follow a pattern & always save pots & pans for last. I love using the Seventh Generation products! They makes my dishes super squeaky clean! I wash my dishes manually and that’s exactly how I do it. I haven’t tried that brand, yet, but I will check it out. I’m lucky my husband does the dish washing for me! Between the cooking and the parenting, I’d be overwhelmed if I had to clean up too! I prefer dishes to bathroom or laundry. Love natural products. thanks for sharing the great tips. i actually like washing dishes so when i have a great soap that always makes it better. These are great tips! A great soap is the most important part! There have been a few brands I have used in the past that left the dishes still dirty and greasy. These tips are great! A good dish liquid makes a huge difference! I am spoiled because my hubby usually does the dishes! I do like the 7th generation cleaning line though! Do the pets ‘pre-treating’ the dishes count as a trick? Haha, I think doing the dishes right away, before gunk sets in, is my best trick or tip. These are great tips. I always buy a good quality dish soap. It make a huge difference in how much you need to use. I have to admit, I hate doing dishes LOL. Seventh Generation sounds like a lovely brand! I like the tip about assigning one glass/bottle per person for the day. It is so much easier that way! I used to get so annoyed if they’d use multiple glasses throughout the day! LOL. I need to take some of these tips into consideration. We always have a sink full of dirty dishes, even after I swear I just did them a few hours ago. After being married for 7 years me and my husband learned that I love to unload and he prefers to load. Now we just tag team it and neither of us has to do the one we dislike very often! A good dish soap is super essential. I am always seeking the perfect one. I also would add to rinse dishes the second you are done using them…this is a tip from Julia Child. Soak the dirty ones for a couple hours and then try to get off the stuck on food. Once it’s softened up its so much easier. Thanks for sharing this. I’ve been trying to move towards all natural products. I never even thought of my dish washing liquid! I hate doing dishes, maybe following your tips it will get done much faster. Thanks for all the tips. Thanks for sharing this! I’m always on the lookout for natural products. I’ll have to give this a try.